The mission of Belmont Elementary School, located at 1517 Bolling Road in Roanoke Rapids, is to help students learn to be respectful, responsible, cooperative and courteous by providing a safe environment with opportunities to learn and succeed. Students of Belmont Elementary School, a K-5 school that is part of the Roanoke Rapids Graded School District, made a pledge to the school and the community: I pledge to bee the best person I can bee, to learn all that I can learn, to treat others as I would want them to treat me and to always try to do my best. 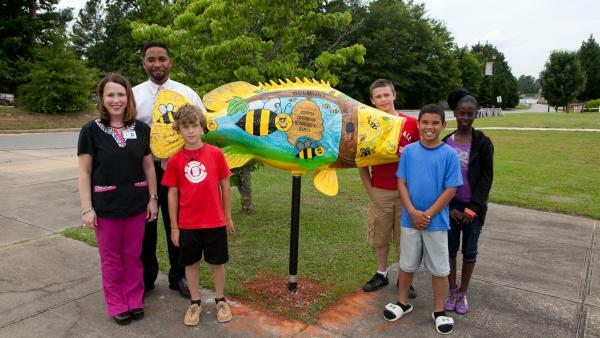 Belmont Elementary School's mascot – the BEE – is pictured in a variety of ways in their Roanoke Valley Rocks fish, painted by local artist Sarah Davis. The four key student conduct concepts are also depicted on the fish: courtesy, cooperation, responsibility, and respect. By teaching students those core values, Belmont Elementary School is building a generation of responsible citizens. Four of those future citizens who have now completed their Belmont education and graduated from the 5th grade are pictured with the fish. Shown here are the following: (l-r) Artist Sarah Davis; Principal Kelvin Edwards; and 5th grade graduates Garison Medlin, Chaseten Martin, Elijah Short and Kaniah Woolfolk. These students demonstrated that the Class of 2020 Rocks too!